You certainly have heard a lot about the January 7, 2015 tragic shootings in Paris of 12 cartoonists, journalists and staff of newspaper Charlie Hebdo. The day after that, I received emails from friends worldwide, notably from Australia, expressing their profound sadness and sympathy -- describing such brutal act as a bloody offence against freedom of speech, liberty and peace. My responses included notes on immigration, identity, social inequality and education. "I do not agree with what you write, but I will defend to death your right to write about what you think." This was written in the 18th century by Voltaire who experienced life in prison and exile for his writings that displeased people in power. 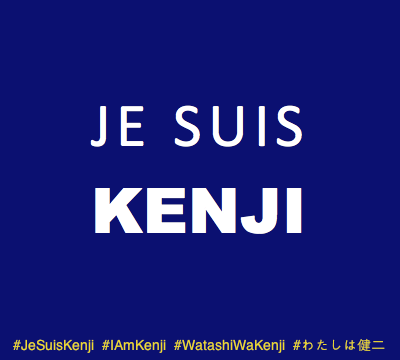 Je suis Kenji. Je ne suis pas Abe. Donnez une chance à la paix. I am Kenji. I am not Abe. The year is coming to an end, and this is my last article in 2014. We've read and heard a lot about crimes, illnesses, injustices, the Ukraine crisis, shoot down of Malaysian Air Flight 17 with nearly 300 people on board, abduction of Nigerian girls, Ebola virus and on-going Middle East conflicts. In fact, there are more happy stories and remarkable progresses than gloomy ones. There have been useful research findings and inventions, such as robotic exoskeletons that can provide support to a ravaged body that needs to heal. There are now about 3 billion people in the world who have Internet access. The FIFA World Cup, which was held in Brazil from June 12 to July 13 and won by Germany, was a success. The Rosetta spacecraft's Philae probe landed on Comet 67P, which was the first time in history. National and international laws have been introduced and collaborations established to combat organised and cyber crime, terrorism and tax evasion (e.g. US FATCA - Foreign Account Tax Compliance Act that requires US citizens, including those who live outside the US, to report their financial accounts held outside the country; and obliges foreign financial institutions to disclose to the Internal Revenue Service (IRS) information about their U.S. clients. This increases national tax revenues as it makes it difficult for US taxpayers to conceal assets abroad). There have been local and global meetings, conferences, working parties, fund-raising events and other gatherings addressing social, political, economic and environmental concerns.